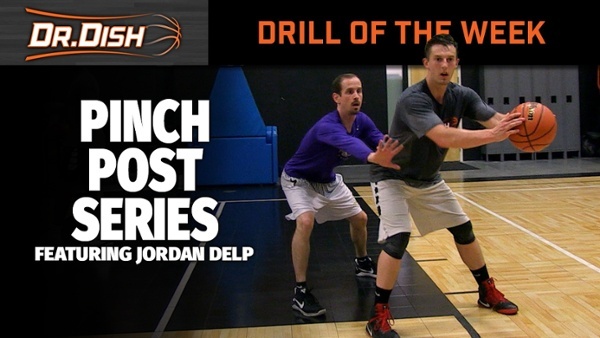 We're excited to release the newest drill series from our friend and partner Jordan Delp of Pure Sweat Basketball! Jordan is one of the premier trainers under the Pure Sweat umbrella and works with much of the top talent in the Iowa/Illinois area. We were very fortunate to have him join us in the Dish Lab recently to demonstrate a few different ways to utilize the Dr. Dish All-Star during training sessions and basketball practices. In this breakdown, Jordan focuses on the Pinch Post area or 4 different options to attack when catching the ball near the elbow. Check out the full progression below! As one can see in the video, we're using the Dr. Dish All-Star away from the basket to simulate a game location pass from the wing. This allows the players to catch in a more game-like fashion and also work on shooting AND finishing. No other machine in the world is designed with the patented swivel net technology of the Dr. Dish All-Star for game-like training. This is a great progression to work on different options near the elbow while simulating how the on-ball defender is playing. Rip through attack: If the defender is pressing up, this is a great opportunity to sweep low and attack their outside foot to get to the rim and finish strong. Fake hand off/jab step: Again if the defender is pressuring but is sensitive to the jab step, this is a great way to create space for an open jump shot at the elbow. Fake back cut/jab step/shot fake/attack middle: If the defender stays honest after the initial jab step and pump fake, a great option is to attack the middle into a one dribble pull up. Double fake/attack baseline: This is a great option to really get the defender off balance and guessing. By using the knee-knee ball fakes, the defender will often bring their hands down. Once this happens, make sure to sweep up high and attack towards the baseline. Make sure to work on each one of the options to combat however the defense is playing. Being able to score in multiple different ways will make you incredibly hard to guard. We'd like to thank Coach Jordan Delp again for joining us in the Dish Lab! Stay tuned for much more great stuff coming from him. For more basketball drills and videos, check out this page.